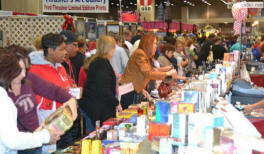 Stewart Promotions has been promoting some of the best Flea Markets in the United States since 1976. Our shows consistently draw 1,000's of shoppers each weekend, and our rates make it very affordable for you to reach these consumers. Looking for Show Dates & Booth Prices? You can find all of our show dates and pricing by clicking on a show from the menu to the left from any page on our website. Want to Reserve a Booth? It's Easy! The easiest way to reserve a booth is to pay with a credit/debit card via our website. Click Here to Book Online Now! You can also call our office at 502-456-2244 during office hours Monday and Wednesday 10-4 and Thursday 10-2. Thank you for your interest in setting up at our shows and we hope to hear from you soon! Does the booth price cover the entire weekend? Yes, the price listed for all of our shows is for the entire weekend. What is your e-mail address? Can I reserve a booth via e-mail? Our e-mail address for general questions is info@stewartpromotions.com , however we do not take reservations through our e-mail address. You should use our Online Booking for internet booking or call our office at 502-456-2244 during office hours to book a show. I need to cancel a show! Who do I call and how late can I cancel? If you are calling during office hours (Mon/Wed 10-4 and Thurs 10-2), please call 502-456-2244. If you need to call us at the venue of the show, please refer to our hotel sheet here. You will find the number for each venue just below the city. If you are unable to reach us by phone, please e-mail info@stewartpromotions.com. If you do not get in contact with us during office hours or at the venue before the opening time of the show, you are considered a no show. Please call us as soon as possible if you need to cancel. If you have a deposit down on a show, you will get a full refund as long as you cancel before the show opens. Are there tables and chairs available at your shows? Yes, you can rent tables for $10 each. We offer 8' tables at all shows and 6' tables at some venues. Chairs are FREE of charge at all of our shows. Can I get electricity in my booth? Yes, please check the page for each show for pricing. Some are free and others have a small fee. How long in advance should I call to book a show? You can book most of our shows at any time during the year. There is no real "deadline" for booking, however, it is best to book early in case we sell out. Can I pick out my booth space from a floor plan? While we do not allow you to pick out a particular space from a floor plan, you may make a request for a particular booth space or area when you book your space. For instance, you can request a corner, wall, near restrooms or concessions, etc. We will always do our best to meet your request. I have booked my booth...Do I get my booth number or parking passes before the show? You will receive everything at the show when you arrive for set up. We do not give out booth numbers prior to the show as sometimes that number may change at the last minute if we can upgrade your booth. You will not be charged to park during set up times....and will receive a pass for the rest of the weekend.